For me Stan serves as an inspiration somewhere along the lines of Walt Disney (whose company now owns Marvel). He's the proof that just starting out with ideas can lead to success that changes the world. Stan certainly didn't create the Marvel universe and characters alone but without him superhero comics and movies may well look very different today. Stan was the guy who understood that making superheroes relatable, giving them more ordinary problems, and challenges in their daily lives, as well as having them save the world, was something that would appeal to comic book readers. He wasn't wrong, striking gold with Fantastic Four in 1961, and then again, not long after with Spider-man, arguably one the world's most relatable (and biggest) superheroes. 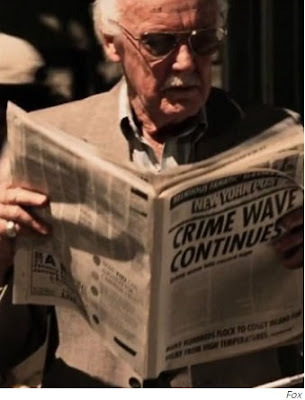 I'm not a fan of the first Amazing Spider-man film with Andrew Garfield in the lead role but the movie does give us one of the best Stan Lee cameos, placing him front and centre in the frame. To reinforce the point, Stan didn't physically draw any of the original designs for any of his characters. He was the idea guy. The author. He would collaborate with various artists to come up with the actual physical designs. However, without him, many of the characters just wouldn't exist. That's really my take on who Stan was to me. A guy who thought up crazy ideas for characters and stories, and was lucky enough to be in the position to get them out into the world where people could read them. Things pretty much snowballed from there until we have the Marvel Cinematic Universe of today, featuring characters from the very early years of Marvel and beyond. If you're that kind of person, who just loves creating characters and putting them in stories then Stan shows you just how far that can take you if you're willing to send them out into the world. If there's one person who I think would approve of Stan living on as a fully CGI actor in future MCU films it's likely it would be Stan. It would be great to see his cameos continue to the point where he really is the man out of time. Not that Stan needs cameos to be remembered but part of the fun of a Marvel movie is being surprised by his appearance. Though I'd also be happy if his cameos became as simple as a strategically placed poster of Stan's face with 'Have you seen this man' written underneath it. Anyhow, RIP Stan. If you'd like to learn more about Stan's life story he did release a memoir book in comic form which I reviewed back in 2016. It covers most of the key moments of his life story to that point, and makes for a very interesting read.